Remember the fabulous hamper I received from Capricorn Goats Cheese? 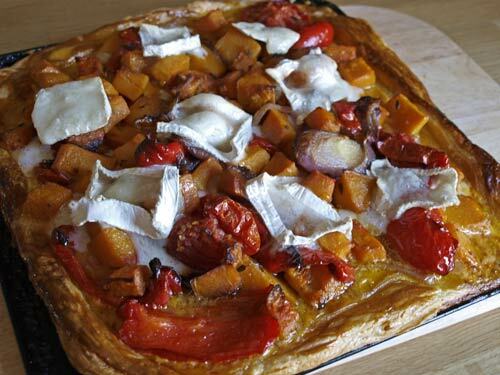 As well as making the Chicken stuffed with figs, goats cheese and honey, I used some of the roasted vegetables that I served with the chicken to make a lovely vegetable tart. Roll the pastry out to fill a 30cm x 30cm baking tray, use the tip of a sharp knive to score the pastry about 2.5cm from the edge, all the way round. Don't cut right through just score the top of the pastry dough. Brush the edge of the tart with beaten egg. 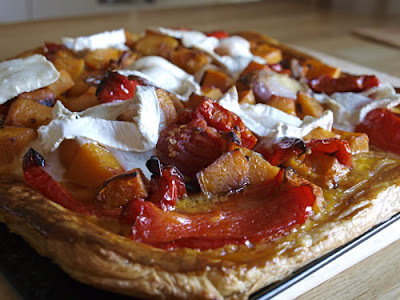 Cover the pastry dough with the roasted vegetables and then distribute the goats cheese slices evening across the tart. Bake in the oven for 30-40 minutes until the pastry is puffed up golden. Serve with a mixed salad. This is such an easy dish to make and the combination of the juicy roasted vegetables, soft creamy cheese and crisp, crunchy pastry is ideal for a simple lunch or supper. Disclaimer: This is a sponsored post. I was not required to write a positive review and any opinion expressed is my own. 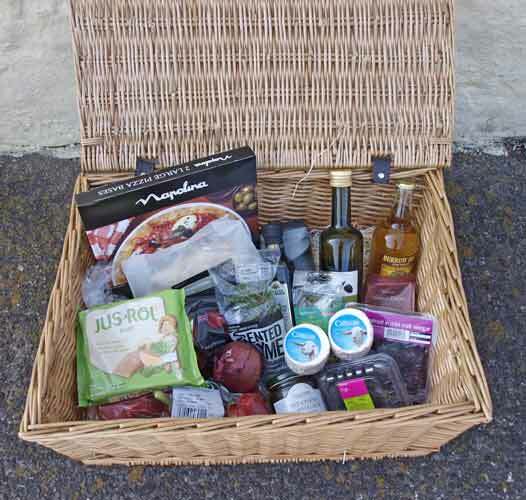 That is a fabulous hamper indeed and a delicious looking tart! I really shouldn't read food blogs before lunch! Would you like to enter this to AlphaBakes? This looks absolutely delish! I love cheese anyway - goats cheese is also one of my favourite types. That looks really tasty. Roasted veg and goats' cheese go so well together. Looks delicious - fresh green salad and a glass of white for lunch, perfick! Goats cheese and roasted pepper tart - lipsmackin' food. How many do you think it would serve Janice? Ros - hadn't thought about it being a 'V' for Alphabakes! Will enter it. Jacqueline - If you accompanied it with a salad, then probably six, or if you are greedy, four! What a great hamper! I love goat's cheese but noone else here does so I rarely indulge.